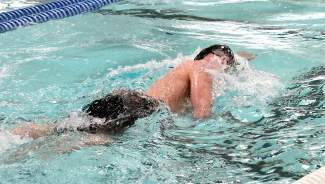 Incline swimmer Jimmy Baldwin represented the Highlanders well at the Division I-A state championship meet in Carson City this past weekend. Baldwin, who was the only Incline swimmer to make the state cut at regionals the week prior, qualified in two events, the 100- and 200-yard freestyle races. He raced to a seventh-place finish in the 200 free, in a time of 1:57.24, and placed eighth in the 100 free, in 53.19. Boulder City, the top Southern seed, won both the boys and girls team titles. Truckee’s boys and girls both finished runner-up.